My Better Together module solves a particular problem: allowing you to offer a "Buy One Get One Free" discount on particular items or categories of items. But what if what you want is Buy One, Get One Free across the entire cart? Or Buy Two, Get One free, or Buy Two, Get One Half off? This is what BOGO does. Buy <M> items, get a discount on <N> items of <X> percent or dollars each. BOGO settings are global and apply to all your products. Specific exclusions may be created, but otherwise the settings are universally applied. If you do not want all (or most of) your products subject to the rule Buy <M> items, get a discount on <N> items, look at Better Together instead. Example Discounts: I have provided several examples of Zen Cart BOGO Discount discounts. Current Version: 1.2 Occasionally, new features are documented prior to being publicly available; please check the version history to ensure the feature you want is available in your version. Configuration: BOGO is configured on the admin->modules->order total screen. A single configuration is used for the entire cart; if you want to selectively offer buy-one get-one discounts or buy-two-get-one discounts, please look at the alternatives, Better Together or Combination Discounts. Normally, the BOGO discount is not shown until the second page of checkout. If you want to show the discount on the shopping cart page, look at Discount Preview. Alternatives: BOGO Discount configuration applies to the entire cart - all items are set to buy-one, get-one, or buy-two, get-one (or whatever your configuration specifies). Sometimes this is not a good match for a shop owner's requirements; if you want to selectively offer buy-one get-one discounts, take a look at Better Together. If your discounts require the purchase of more than one item (for example, buy-two, get one, etc. ), take a look at Combination Discounts or Zen Cart Free Gift Chooser. This mod permits a shop to define "Buy some-number, get some-number at a discount" style discounts across the entire inventory. Discounts can be applied to items of the same category, product id or without restriction. The discounts may be expressed in percentage or currency units. Various user exits are provided to make it easy to extend the mod to meet shop requirements. BOGO Discount is configured through the Admin interface (Admin-> Modules->Order Totals->BOGO Discount). The image above shows a shop which gives a "Buy 2 Get 1 100% off" (i.e. "Buy 2 Get 1 Free") for all items in the store. 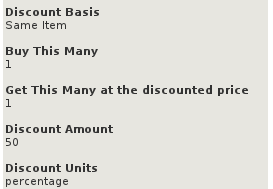 Items which are counted to meet the condition ("Buy 2") are counted from most to least expensive, and items which are to be discounted ("Get 1 Free") are from least to most expensive. So BOGO Discount always discounts the least expensive items possible. Let's assume for this example that Buy This Many is 1, and Get This Many is 1. If Discount Basis was "Same Item" and one shirt A size Medium and one shirt A size Large were purchased, the less expensive shirt would be discounted. If Discount Basis was "Same Item, Same Attributes" and one shirt A size Medium and one shirt A size Large were purchased, there would be no discount. If two size Medium were purchased, one of the shirts would be discounted. If Discount Basis was "Same Parent Category" and shirt A and shirt B were purchased, the less expensive shirt would be discounted. If shirt A and pants A were purchased, there would be no discount. If Discount Basis was "Same Top Level Category" and shirt A and pants A were purchased, the less expensive item would be discounted. If shirt A and dress A were purchased, there would be no discount. If Discount Basis was "Same Top Level Category" and shirt A and dress A were purchased, the less expensive item would be discounted. Note that your only options for categories are top level category and parent category. So the category "Neckwear" (which is the grandparent category of bow tie A, bow tie B, necktie A and necktie B) would not be considered a parent category. Specifying "include tax = true" will gross the discount up by the amount of tax that would have been paid on the goods prediscount. This is appropriate for shops under a price inclusive sales tax system, such as the UK VAT. Specifying Re-calculate tax = Standard will recalculate the entire tax based on the original subtotal minus the bogo discount. Even more information about tax is provided at the bottom of this file. 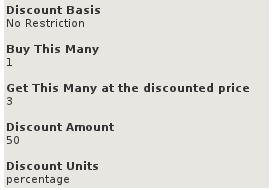 Exclude certain categories from discounting. Exclude certain products from discounting. The function exclude_category() shows you how to add categories to a list of categories to not be discounted. You may specify a parent category id or a top level category id. Each of these functions contains a simple example of how to use it using item and category numbers like 99999, 99998, etc. See the FAQ below for more examples. BOGO Discount discounts off the *gross* price of the goods. This can result in a larger than expected discount if other discounts are added (such as coupons or group discounts), so bear this in mind when creating your discount strategy. BOGO Discount is an "Order Total" module, which means that by default, the discount is not shown until the second page of checkout (Payment Information). 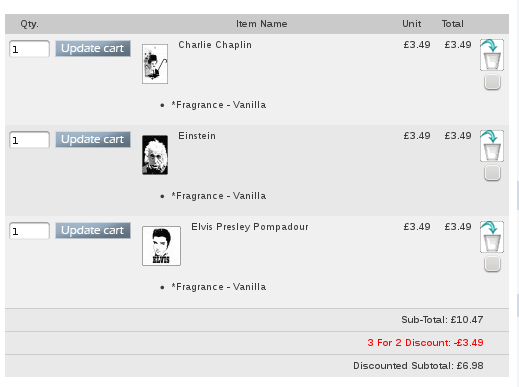 However, using the Discount Preview module will allow you to show the discount in the shopping cart. If you already have the BOGO Discount module installed, please deinstall your old copy by going to Admin->Modules->Order Total, selecting "BOGO Discount" and pressing the "Remove" button. Make a note of your settings so you can apply them to the new version. Copy the contents of the unzipped folder to the root directory of your shop. NOTE that these files assume your template name is "custom," so any file with "custom" in its path name will need to be renamed if you are using a different template name. Note: If you are using Zen Cart 1.5.5 or higher, your template name will be "responsive_classic" if you have not changed it. 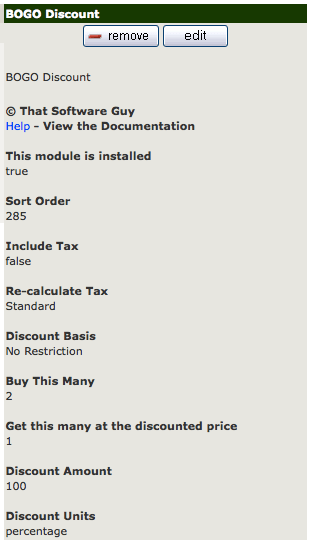 Login to admin and in Modules->Order Total you will see 'BOGO Discount' listed along with all the other modules available. Decide on the parameters you wish to use. The easiest way to do this is to open a shopping cart in another window, and just try different discounting models. The discounts are shown on the second step of checkout in "Your Total" under "BOGO Discount." BOGO Discount may be automatically displayed on the product info page, using the built in marketing template. The placement of this code is a matter of personal preference; try placing it below the product description and adjust to your tastes. It creates a message on your page to promote your discounts. Only one div block of text will be produced, with the div id bogoDiscountPolicy. In the first configuration example, you saw "Buy any 2 items, get 1 more free." Here are some more examples. "Buy one, get another identical item half off." "Buy one, get another from the same category free." "Buy any one, get three more lesser or equal value half off." Discount Preview makes BOGO Discount pop! It shows the discount on the shopping cart page, instead of making your customers wait until the checkout payment page to see their discounts. Here's a screenshot of the shopping cart page on a cart using Discount Preview and BOGO Discount. The discount was Buy 3, get the least expensive free. Notice that the Description has been changed to "3 for 2 Discount." In version 1.0, for Discount Basis other than No Restriction, BOGO would stop after the first discount. Q: I have different levels and/or amounts for different categories. How can I handle this using BOGO Discount? A: If you have multiple discounting schedules with different levels or amounts, you should look at Table Discounts. Q: I'm using Discount Basis "Same Parent Category" or "Same Top Level Category" and it's not working! Q: I can't seem to get BOGO Discount to work. What am I doing wrong? Go to Admin->Modules->Order Total. Do you see BOGO Discount? If not, then you haven't installed it. Follow the README. If you do see it, the circle at the right hand end of the row for BOGO Discount should be green. If it's not green, reinstall it. Click on BOGO Discount. 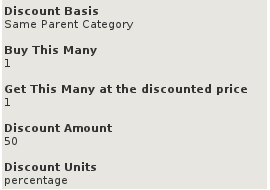 The Discount Amount field is numeric. Do not use dollar or percent signs in this field. If you're using Discount Basis "Same Parent Category" or "Same Top Level Category," see the previous FAQ question. Q: Why is there a BOGO Discount contribution in the first place? A: Each of my discounting modules is different (sometimes in a subtle way), and meets a need that people in the Zen Cart community have expressed. If you're not sure whether BOGO Discount is for you, take a look at the Zen Cart Matrix-o-discounts to see some example discounts that other people have created with my software. 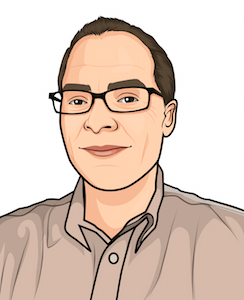 Q:What does BOGO Discount do that is different from my other discounts? Big Chooser and Combination Discounts allow multiple rules for BOGO discounting based on product or category, but each rule must be specified in code. 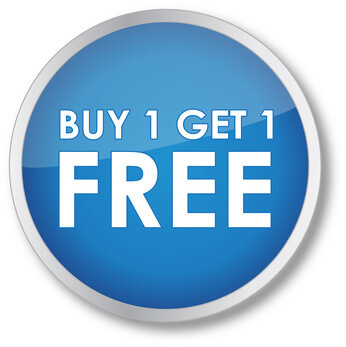 BOGO Discount has one global rule which is specified by an admin panel. Better Together can only do "Buy 1, Get 1 at a Discount." BOGO Discount can do "Buy some-number, get some-number at a discount." Changing behavior (from "Buy One Get One free" to "Buy Two, Get One Free") involves modifying core code Changing behavior involves changing admin panel parameters. Alternately, you can indicate that you have a discount policy by adding to TEXT_INFORMATION in includes/languages/english/shopping_cart.php, and inform the user that the discounts will be calculated (and visible) at checkout time. Additionally, changing SUB_TITLE_SUB_TOTAL in the same file to something like 'Sub-Total BEFORE Discount' will emphasize the fact that a discount will be added at checkout time. Q: I only want discounts applied to items in category 11 and 12. How do I do this? Q: I don't want discounts applied to items in category 7 or 8. How do I do this? A: Create your custom template if you haven't already done so. Then customize the file includes/templates/template_default/templates/tpl_product_info_display.php Look at the instructions in marketing. Q: Can you explain how sales tax works? A: Yes. See this page. I charge $25 for the BOGO Discount Zen Cart. Buy BOGO Discount!